The west has canyons and caves, the great plains region its prairies and ranges. Maine and Washington bookend the north with soaring groves abetting salty sea air. Such American landscapes are grand. The hollows of New York’s Hudson River Valley and adjacent Catskills are not. 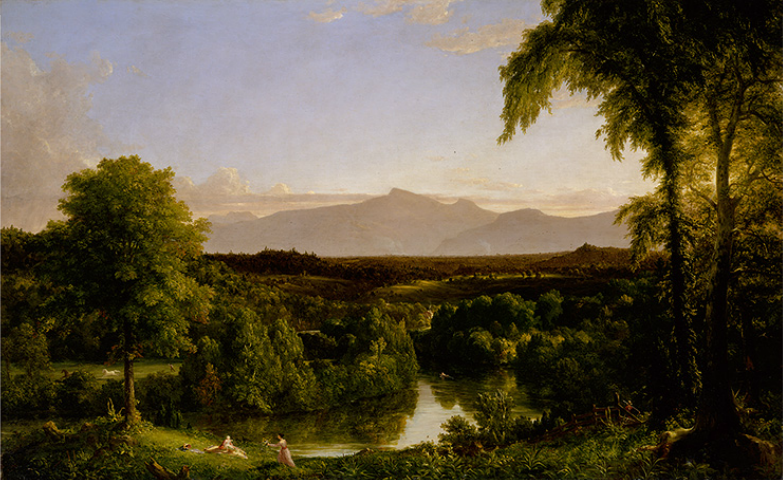 “A drowsy, dreamy influence seems to hang over the land, and to pervade the very atmosphere,” writes Washington Irving in “The Legend of Sleepy Hollow.” This lulling landscape inspired his place names and plots. I.e., he imagined a man falling asleep for 20 years and awakening unaware of America’s bloody revolution. Rip Van Winkle’s dog is gone, his son is grown, and King George III’s face has been replaced by George Washington’s on swinging tavern signs. And yet, Rip Van Winkle’s fate when he finally blinks away two decades of sleep is to return to idle existence in this green-gold land. It’s already getting dark and it has been raining for hours. The view through my cabin’s little portholes is black and no different than with the shades down. So I lock up, crank up the heat, and begin writing. By 9pm, I feel I’ve done enough and tune into a radio station offering midterm election results. Texts penetrate my cocoon to tell me the democratic blue wave disappointed. Removed in the woods, I go to sleep. It’s difficult to get around without a car. With the nearest suggested trailhead a 15 minute drive away and the weather acting decidedly November-esque, I forgo the hike to the actual hike and settle for a jaunt around the Getaway grounds. These being small, and not wanting to lurk around other people’s cabins, I decided to tuck into the book I’ve brought for writing inspiration. The inspiration hasn’t quite worked so I turn back to reading. I make chili on my cute plug-in stove top and polish off a cute bowl of it outside my cute cabin. I pull up Google maps and explore my location, seeing “Rip Van Winkle Hollow” just three miles away. I start meditating on the landscape peppered by hollows—serene like elven glens, but filled with sleepy Dutch men. Here, look, some writing progress at least. No one appears to have been to the Rip Van Winkle Hollow. The whole wide web has no pictorial evidence that the spot is any sort of landmark, geographic or literary. Whether the ground even depreciates, I don’t know. Whether it’s on private land, I also don’t know. Between rumors about irascible neighbors and the hour long walk (what would be an 8 minute drive, says my contraband phone), I don’t dare investigate. I find this a surprising caprice for Thoreau, who I picture as a stoic realist with a close cropped beard and no patience for the supernatural. I also think that Christianity and candlelight are more likely provocations for witches and ghosts than deterrents. If Thoreau was 136 miles west of Walden, he wouldn’t find candlelight sufficient to dispel an eerie atmosphere. There’s something vacuum-like about these woods. The trees aren’t particularly dense, and the most threatening wildlife I’ve seen is a mosquito. But you get the sense that one hollow looks like every other. Thinking yourself on known ground, familiarity could fall out from under you in the realization that you’re utterly lost. Best not to stray far. Thoreau asks, “What danger is there if you don’t think of any?” Here, it’s easy not to think of any. As long as your cabin is behind you, just past those thin trees, you could lie down and sleep, unmolested and undisturbed, the landscape shimmering like a dream. Maybe I’ve been in one. When I return to civilization, perhaps a king’s profile will be back on the tavern signs. Maybe we were on the cusp of a revolution and I fell into a 20-year slumber. I’ll be 46 and a stranger to my family. In the autumn of my life, I’ll awaken in these little mountains enfolding the Hudson, which winds its way from Lake Tear of the Clouds to the empire city I sought to get away from. I could return there. Or, I could go on in drowsy peace among these hollows.